Refund - money is transferred back to the customer electronically. Only Credit card or ACH payment methods can be used for a Refund, as this makes a call to your payment gateway to transfer funds from your merchant account back to customer. Cancel Payment - If the payment did not go through for whatever reason (credit card chargebacks, bounced checks, etc.) then this would create a compensating negative payment to offset the original and still keep the accounting records correctly. House Credit - Unlike a Refund where funds are transferred back to the customer, this is for cases where you want to apply an adjustment (e.g. courtesy credit to address a customer complaint). 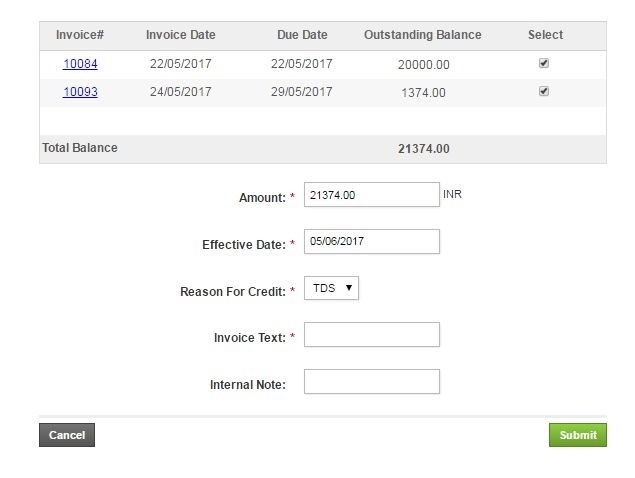 The house credit is automatically applied when one of the Refund sub-options are selected. Various payment processors and gateways impose their own business rules and practices regarding refunds. BluSynergy abstracts out the differences and performs the following sequence of steps when performing a refund. Only refunds processed in the BluSynergy system can be refunded. Only credit card and ACH payments can be refunded. First, we attempt to perform a VOID transaction. A VOID is typically used when the transaction is not yet settled. Note that various payment gateways perform automatic settlement at different schedules, so it is not always possible for our systems to know if a transaction is already settled. If the VOID is successful, then nothing more needs to be done. The customer will never see this transaction on their statement. If the VOID fails AND we also have a previous payment, then we try a "Linked Refund" transaction (various processors have different terminology such as "Credit" etc.) In this case, the previous transaction is referenced in the call to the payment gateway. Note that processors impose a limit on the age of the original transaction (usually between 60 - 120 days). If the Linked Refund fails, then we attempt an Unlinked Refund (provided the processor supports this via their API). As a result you may see up to 3 transaction entries corresponding to a single Refund operation in the BluSynergy system.